As we're inching closer to Summer I've come to the horrifying realization that my body is 100% not ready to be out in the open. Although my face doesn't get dry at all over the Winter, my body always does and it's been looking and feeling a little lack luster recently. 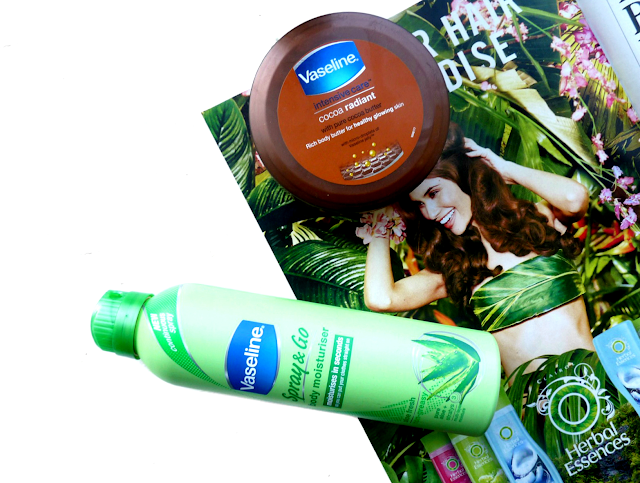 So, I've been stepping up my moisturising game to really nourish my parched skin with two of my favourite moisturisers from Vaseline; their Cocoa Radiant Body Butter and Aloe Vera Spray and Go. The reason I have two go-to moisturisers is because I like to have one that I know I can apply fuss free if I'm in a rush and also one that I don't mind taking it's time to absorb into my skin. You've probably guessed that the Spray and Go is the one I reach for when I'm short on time- the name gives it away I suppose! I absolutely love the Vaseline Spray and Go moisturisers, I've never used another spray application moisturiser and they've given me such a good first impression of this idea. I'm surprised they aren't more of a big deal, because they are such an essential for someone like me who does not have the patience to put on a slow absorbing, heavy moisturiser on when I'm getting ready to go out in the mornings. I tend to use this moisturiser weekday mornings when I want to get ready in as little time as possible because it gives my skin the moisture it needs, whilst also soaking very quickly in my skin. It doesn't technically work in a 'spray and go' manner because you spray, rub in, then go but as soon as you rub it in, the feeling on it sitting on your skin disappears and you can crack on with getting dressed. It is incredibly lightweight and very quick to rub into your skin; it's definitely the most effortless moisturiser I've ever used. On top of it being super practical and morning friendly, I also adore the gorgeous aloe vera smell which just makes me feel even fresher after a shower. The only thing I will say is the spray is cold af, so if it's a chilly morning I will simply spray it onto my hand and then rub it in. But, on the plus side, it does wake you up if you're having a groggy morning! Although I would wholeheartedly recommend this amazing, handy moisturiser - I don't know if it's because it absorbs so quickly - but I do kind of feel like it's not of an intense moisturiser as it could be which is why I also like to use my heavy duty one on the days I'm not in a rush. My ultimate heavy duty moistuer is Vaseline's Cocoa Radiant Body Butter, which I love to use in my evening routine before bed and also on the days where I'm having a slower, more relaxed morning. This is a much more of an intense moisturiser, which is perfect for restoring the hydration of my skin in its time of need. If you have very dry skin in general, I would definitely recommend this as it really is very nourishing and helps my skin feel smooth and radiant at once. Similar to the Spray and Go, I adore the rich, cocoa scent of this gorgeous body butter and it lingers on your skin for so long, it just makes it even more of a luxurious experience. The product comes in a decent sized tub, it's lasted me a long time already and I've only used about quarter of the entire tub so far, so it's safe to say a little of the product goes a long way, which is great of any beauty item. I do find this is slower to absorb into my skin than the Spray and Go, but what it lacks in quick absorption it makes up for with intense moisturizing. This is definitely a pamper night essential, so if you're looking for a super hydrating body butter which you leave you feeling super soft and radiant, this will be right up your street.